Nob Hill is famous for various things: for providing spiritual enlightenment at Grace Cathedral, for dazzling the world with the ultimate in exclusivity at the Pacific Union Club and for providing us with a short word for the very rich (‘nobs’). 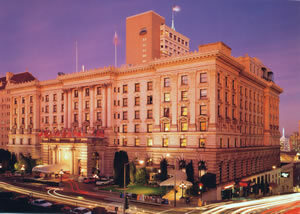 It is also famous for one of the world’s legendary hotels – the Fairmont. For this hostelry has a significant place in history. At the end of the Second World War, a conference was held in San Francisco to invent an organisation which would promote world peace. 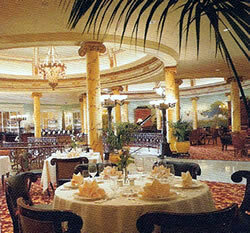 It was in the Garden Room of the Fairmont Hotel that the Charter of the United Nations was signed. That is why the national flags of the original signatories still fly above the porte-cochère at the main entrance. And – a fact perhaps even more exciting for this visitor – it was here, in the hotel’s Venetian Room, that Tony Bennett first sang the song, ‘I left my heart in San Francisco’. The Fairmont has, indeed, seen some wonders. If, like me, you have loved those old Hollywood films in which the drama begins in a hotel lobby of vast proportions, you will have a feeling of déjà vu when you first enter the Fairmont. For here is that space with which you are familiar on celluloid: a huge hall of marble columns, gilt carving and potted palms, abuzz with the comings and goings of important people. You have the sense that the place has been busy for a hundred years. And you are right. The hotel had only just been built when it was burnt down in the fire which followed the earthquake of 1906. Twelve months later it was open again, with its magnificence restored. At the opening banquet, 13,000 oysters were consumed, and thereafter the likes of President Theodore Roosevelt and Rudolph Valentino crowded its sumptuous apartments on Nob Hill. Now it was my turn. This was very much a traditional hotel room. By the entrance was a large walk-in wardrobe with a private safe. 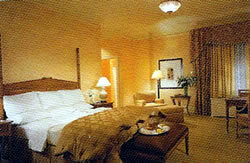 The bedroom itself, decorated in yellow and white, I judged to measure about 16 feet by 12 feet. Its air-conditioning was controllable and effective. The furniture, of polished wood, included two chairs, a writing desk and a console (wherein was the mini-bar). Lighting was from a pair of table lamps and a standard lamp. The bed had, at my request, been made wonderfully soft for me - an achievement for which I congratulate the Housekeeping Department. The bathroom was a place of golden marble and striped wallpaper. It contained one wash basin, a loo, a shortish bath tub with a shower above and a well-placed shaving mirror. Best of all, it boasted an abundance of large white towels. If the quality of an hotel can be judged by the extent of its generosity with bath towels – and there are worse measures – the Fairmont San Francisco is up there with the best. Dining at The Fairmont is done either in the Tonga Room (for Asian cuisine) or at the Laurel Court, off the lobby (for Californian fare). The latter serves breakfast, lunch and dinner. 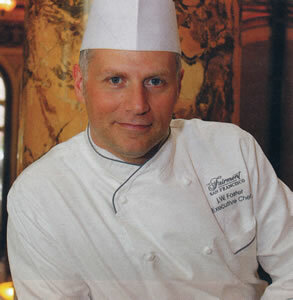 On this occasion, I had the opportunity to sample only breakfast, but on previous visits for dinner I have found the cooking of Chef jW Foster (pictured) to be proficient and enjoyable. I certainly enjoyed my breakfasts surrounded by the columns and pilasters of the Laurel Court. Members of staff, in blue shirts, were helpful and friendly, the seats – upholstered in cream leather, with buttoned backs – were comfortable and the views into the magnificent lobby were really quite inspiring. The wooden tables lacked tablecloths, but the fare I secured from the buffet was all splendid. (The waiters brought my coffee and orange juice.) Porridge, melon, strawberries, pineapple, bacon, grilled tomatoes, even French toast and banana syrup – I tucked into them all with gusto, and felt that 30$ for my morning feast was rather a snip. This was a grand way to start the day. 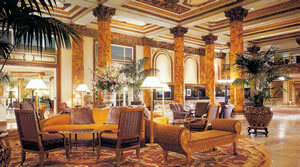 Indeed, ‘grand’ is a word which suits The Fairmont. 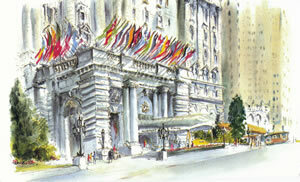 In its architecture, its location and its atmosphere, it is truly a grand hotel of the traditional sort. It is the kind of hotel which plays host to history. Here statesmen sign important documents and crooners sing words which melt our hearts. 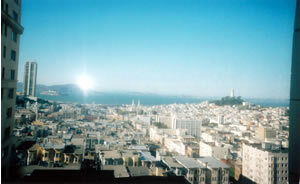 Truly, it is one of the splendours of Nob Hill. 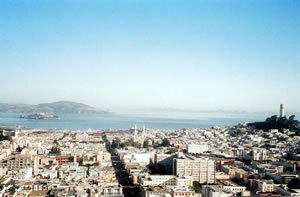 950 Mason Street, San Francisco, California 94108, U.S.A.